Over the weekend, I was north of Belfast visiting a friend in the Glens of Antrim. She took me to see the grave of Seamus Heaney, who died in fall 2013. 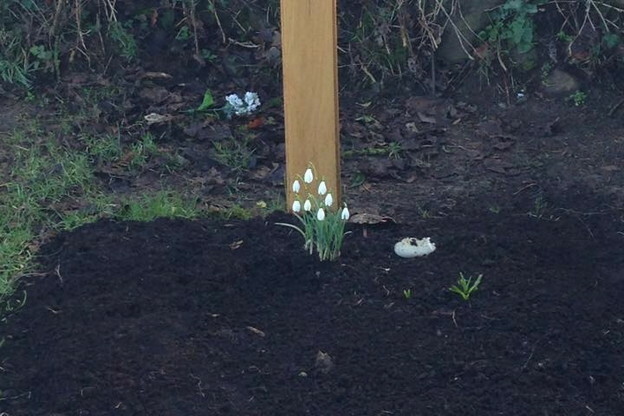 Those are snowdrops in the picture. The grave is in the corner of the graveyard, with a stone wall on two sides. The sign on the road for it is far more elaborate than the grave itself, which is a simple wooden cross. Not pictured here: the fake plastic roses tumbling on the other side of the wall; the discarded headstones piled against the wall. Some hooved animal had made a print in the earth of the grave. Everyone was going to church, and we were poking around the graveyard. The snowdrops, head down, mimic the posture of one looking at a grave, so that you realize you're in the same position as they are. Neither standing up nor resting flat, but bent over, head tilted downward. The fragile, downcast slant recalls the lowered eyes in Renaissance painting, as in Bellini’s extraordinary Virgin and Child. The title of Heaney’s final collection, Human Chain, emphasizes qualities not always associated with Heaney’s poetry: dependency and vulnerability. Looking back through his work, it is easy to miss the moments of weakness within the language of powerful assurance (Station Island is one book-length example of the uncertainty and self-criticism that supply the undertones of his entire career). Part of what Heaney saw in W.B. Yeats we tend to see also in Heaney: a confidence that, when faced with the prospect of poetic failure, he would raise a structure of sound from the abyss. His comments on Yeats’s ottava rima show triumph, sovereignty, mastery. Yeats, Heaney writes, “had written his own oracles to himself and created a fortified space within the rooms of many powerfully vaulted stanzas.” But “in the end the Yeatsian keep of tragic commitment and loyalty is assailed by mutinous doubts about the ultimate value of what there is to keep” (“W.B. Yeats and Thoor Ballylee” 438-9). For Heaney and for Derrida, the poet and the philosopher are the panicked, who see in others a different, but recognizable panic. The snowdrop is a figure of dependency and exhaustion as much as it is a prophet of the spring, the first builder from the thaw. It is the head that hangs, not the strong handshake or the look in the eye. Not the expectation of a saving force that will swoop down. Nothing is about to intercede. No system will respond. Here is the avatar, not of individual strength and sovereign willpower, but of precariousness and care, of dancing in the street and bending the body down to rest. What is here the modest decoration on a grave is everywhere the decorum of a death-in-life. Derrida, Jacques. “The Animal That Therefore I Am (More to Follow).” Trans. David Wills. Critical Inquiry 28 (2002): 369–418. Heaney, Seamus. Opened Ground: Poems 1966–1996. London: Faber and Faber, 1998. ———. “W.B. Yeats and Thoor Ballylee.” In W.B. Yeats, Yeats’s Poetry, Drama, and Prose. Ed. James Pethica. New York: Norton, 2000.